After the disastrous events of Into the Black, Ellie, her monstrous lover Vincent, and Reese, Vincent’s brother, have returned to the safe house. There they try to settle down with the others who had their lives disrupted by the shady organization breeding new monsters. But Ellie itches to get back out and hunt the other monsters she freed rescuing her brother Edward, chaffing at playing house. Edward also battles his own demons. He was experimented on, transformed into a deadly version of the monsters, and fights to keep control of his dark impulses with the help of his blind lover Anna. But the urges to kill, to hurt, to cause fear lurk in his depth. The household tries to heal, everyone of the residents scarred in their own ways. But when women who look like Anna began being murdered, they fear one the monster Delilah has found them and it will only be a matter of time before more pain and suffering are inflicted. Naralim builds on the foundation of her two previous books, using the characters she has built and nurtured, using that as the strength of this novel. Where the previous two relied on fast-paced action to drive the narrative, Shed Some Light is stationary, rooted in a small house in the remote country of Canada. Here the characters, their relationships, struggles, hopes, and fears drive the plot. And she pulls of this transition flawlessly. Her writing has never been stronger. The depth of her characters sustains this novel all on their own so when things start getting tense, you’re all the more anxious because you care for these characters. Naralim blew me away with the depth of her storytelling and the tragedy of the tale she unfolds. If you haven’t read Walking with Monsters, do so. Then read Into the Black, and then read this amazing book! 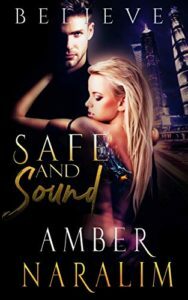 You can buy Safe and Sound from Amazon.